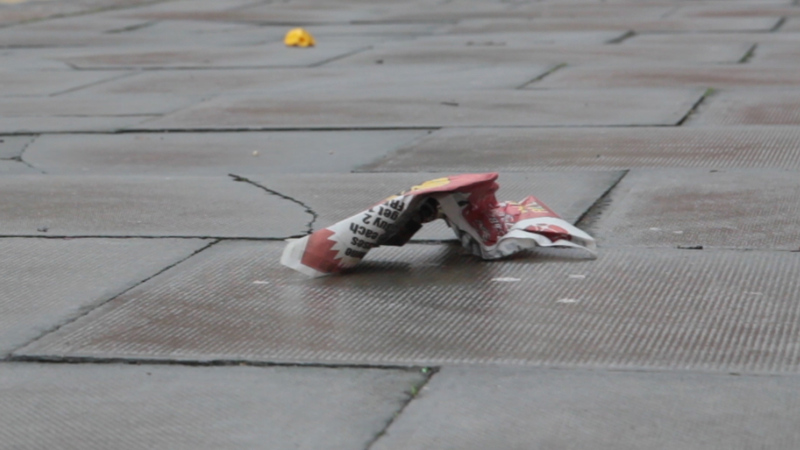 I filmed a piece of crumpled newspaper, with a deflated balloon behind it, on the pavement near the Marlborough Pub in Brighton. It caught my eye and I didn’t know why, consciously, but I filmed it. There was no wind and the newspaper didn’t move at all as I filmed it. In hindsight, I can see this was perfect for the film; however, at the time, I wished for a tiny breeze, at least, to ruffle the paper. I used this shot at the beginning of the film with the soundscape of the next shot over it. The sound of the wind contrasts with the stillness of the newspaper. I showed my unfinished film to Edmund and Scott. Scott stated he didn’t know which of the characters was real – he was reading one of them as real and one as not real. Edmund stated it looked like one of them had seen something in the other one that could not be unseen. This resonated with me although I couldn’t understand how it related to me personally. I still thought the film was about two people going up a hill, self-reflecting and taking responsibility for their actions. It’s obvious to me now that Helen’s expression in the last shot represents the confusion, fear and sadness of someone who is going through disillusionment in a romantic relationship. I decided to get into bed and read but, again, couldn’t concentrate on my book. I remembered I had The Psychopath Test by Jon Ronson on my bookshelf. I began reading it and realised I had been working on this film under a strong belief: that everyone, given the right conditions, will do what they can to help their fellow humans, just because they can. One of the psychopathic traits is to feel no remorse or guilt; another is to manipulate; another is to lie pathologically. Reading about these traits made me realise my underpinning theory, which had been subconscious until now, was incorrect. I decided to focus on the relationship of the people in the film from this angle, whilst still acknowledging the man’s corporate status because he’s obviously wearing a suit (which could be because he impulsively decided to go camping (psychopathic trait no. 14 on Bob Hare’s checklist)). This entry was posted in collaboration and tagged collaboration, psychopathy, relationship breakdown by Julia Fry. Bookmark the permalink.